Need OEM parts for your Chrysler, Dodge, Jeep or Dodge Ram Truck in or near Cleveland TN? 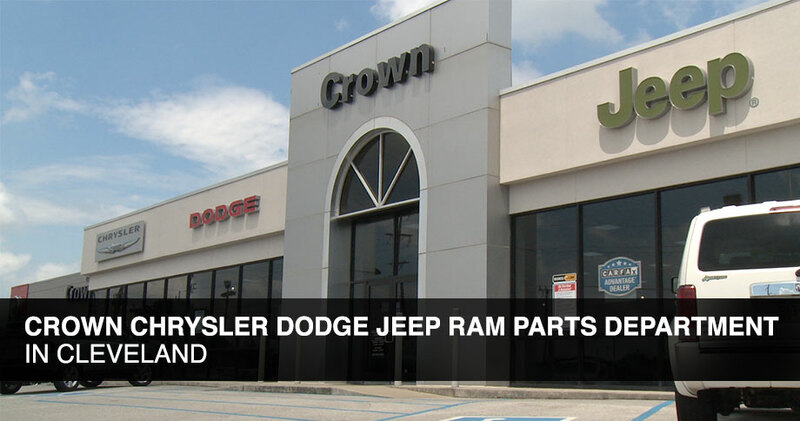 Check out our parts department at Crown Chrysler Dodge Jeep Ram Dealership of Cleveland. From batteries and bulbs, oil and air filters, spark plugs, belts and hoses, wiper blades, ignition parts, brake discs and brake pads, mufflers, tires and more. We carry a large inventory of parts, chances are we stock it and can replace it. Since our inventory is stocked with only factory approved OEM parts, superior quality is always assured. Genuine Mopar and OEM approved parts are the best way to keep your new Chrysler, Dodge, Jeep, RAM running in its best shape. Even if you drive a used car from another brand, we'll be able to order any part you need. When something needs to be replaced, the experts at our service department will handle that with the professionalism you expect from us. If you know you need something replaced or fixed on your vehicle, make a quick service appointment that works with your schedule. Know what OEM parts you need? Check out our Mopar Parts Coupons which will save you money on your next part or accessory purchase. Also take a look at our Mopar Mopar Parts & Accessories catalog and order your parts online. If you would like, stop by our Parts Department at Crown CDJR at 511 S Lee HWY, Cleveland TN near Athens & Dayton and talk with one of our parts department staff. If you still need help, give us a call at (877) 452-1059. Our friendly staff is more than happy to assist you!